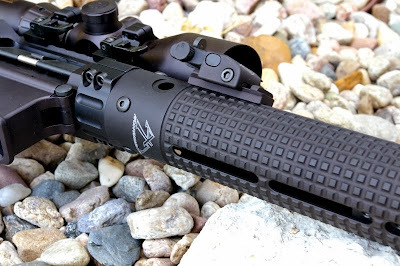 Apex Machine Extended Rifle Length Gatorgrip AR15 Forend Handguard Review I am a picky guy when it comes to AR15s, what I like, what I feel is cool and innovatively useful, versus just cool looking. There are a lot of ninja targeted handguards out on the market with little to support their design other than something that looks good on a custom build. Fortunately Apex’s Gatorgrip handguards are not only one of the coolest handguard designs out there, they are also one of the most useful, ergonomic, light, durable, and stable forends I have used. Dare I say, I even like them better than my beloved Troy handguards. In fact, I liked the design so much that this is my second build with an Apex handguard. My first Apex build upgraded my Spikes Tactical home defense AR15, but today I am upgrading my American Spirit Arms ASA Side Charger upper with a stumpy little 16” bull barrel with a very long Extended Length 15” forend. The effect is a whole bunch of real estate to move around with and a dramatic look unlike anything else on the market. ABOUT APEX MACHINE SHOP Apex Machining is based out of White City Oregon as a CNC production and prototyping machine shop to a variety of industries including Firearms, Aerospace, Electronics, Energy, Aviation, Communications, Construction Equipment, Environmental Quality, Hydraulics, Medical, Food Handling, and Nuclear. Via their capabilities, they have developed and patented one of the most innovative handguards on the market call the Gatorgrip. The side effect is that it looks cool, however the design intent was purely functional. ABOUT THE BUILD One of my more fun builds was the American Spirit Arms ASA Side Charger upper with an ASA sub-MOA 16” bull barrel. The build has been a tack driver with a wide variety of ammo. Recently I swapped lowers to a Anderson Manufacturing Lower receiver with a Barnes Precision parts kit and Mako buttstock and grip. 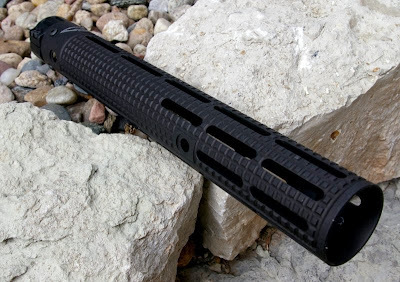 The grippy texture of the Mako grips delivered a bit more confidence when maneuvering the bull barrel and a bit more comfort… but I wanted more forend length and that’s when I reached for the Apex 15” Extended Length Gatorgrip Handguard. 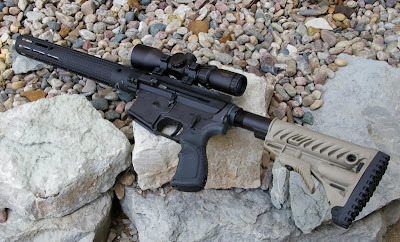 The allusion the 15" handguard creates delivers a look of a short barreled rifle, however even with the tip of the barrel just peeking out it is still a legal 16" barrel. Just to show how wild you can get with the Apex forends from a custom build perspective, I also mounted the completed upper to my Mega Arms billet lower with Ultra Light Ace stock which dubbed the Alien Hunter. 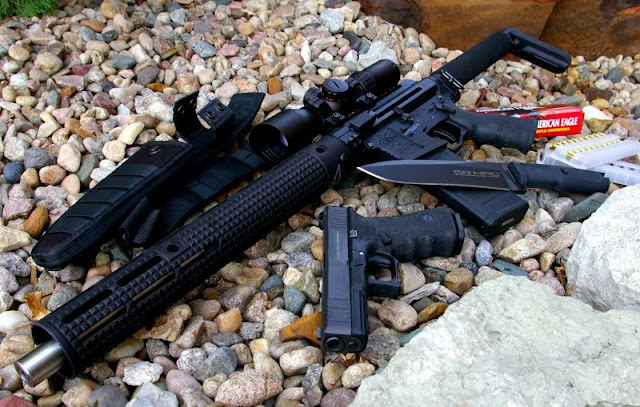 Accessorised with a Salient Glock and Extrema Ratio Doberman survival knife. It made for quite a futuristic build look perfect for your next alien or rodent extermination. 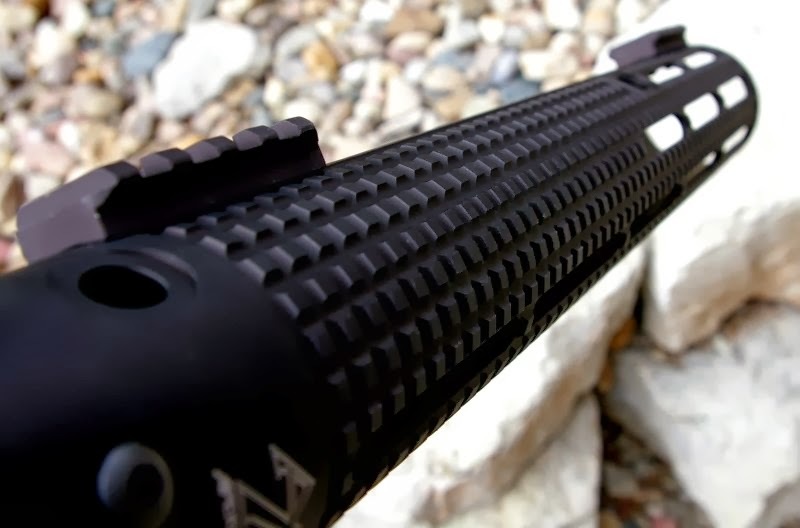 FIT & FEEL The overall fit and dark Type III hard Mil-Spec anodizing on the Apex GatorGrip Handguard is exceptional. Once assembled, the handguard is rock solid thanks to a long upper and lower barrel nut clamp which adds tremendous support to the free float tube. The main complaint I have with almost all quad-rail forends is that they can be rough on the hands over a long day of shooting without rail covers but smooth forends tend to lack grip in some cases. The Apex handguard features a perfect compromise with extra coarse checkering Apex calls GatorGrip. 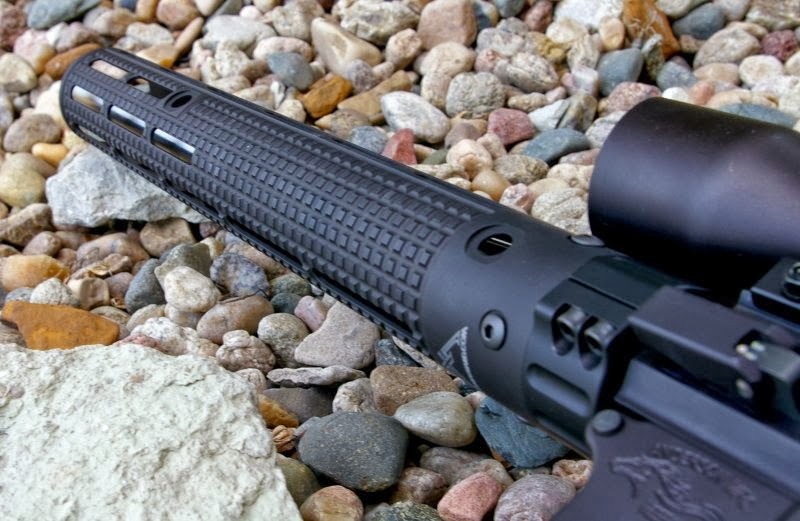 The slimmer overall Apex Handguard profile is possible due to the offset barrel nut clamp. This thinner profile along with the GatorGrip provides a easier to hold hand locking grip all without being aggressive on the bare hand and improves heat dissipation to keep the handguard cooler. At 13oz this extended extended 15” rail is a very light and could save a few ounces over other similar rails I have looked at and tested, but it still feels just as beefy. 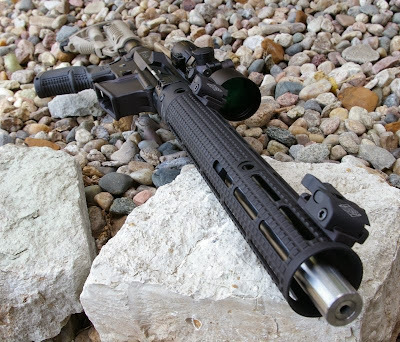 A great feeling handguard with well thought out fit. 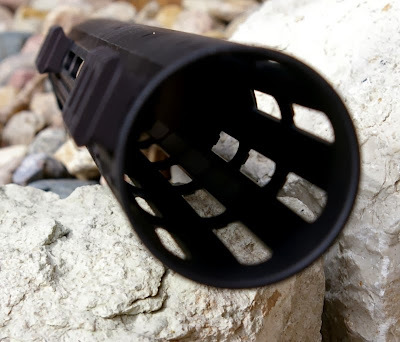 FEATURES Most free float tubes include their own proprietary barrel nut, however the patented Apex Handguard System surrounds and clamps to the stock Mil-Spec barrel nut in a non-indexing style. A non-indexed handguard mount allows you to assure the handguard to receiver alignment is perfect even if your barrel nut is a little over or under clocked. Beyond the immediately noticeable GatorGrip, the Apex Handguard System features a number of vents/slots at all the 90 and 45 degree positions. Apex has called these slots Controlled Tactical Rail Locating system (CTRL). CTRL obviously reduces weight and improves barrel cooling, but they also are designed to attach Apex’s various length accessory rails and add engineered strength. 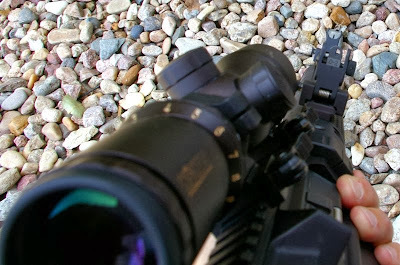 For my personal grip, I find the 9 o’clock positions just a little annoying for a finger operated tactical light, but it is better than other standard 3,6, or 9 o’clock positions. 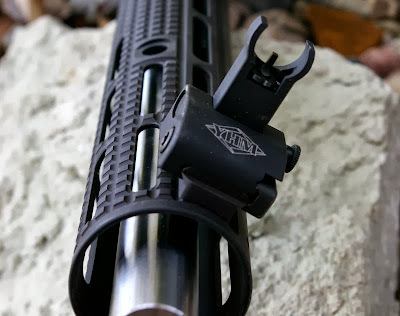 With the Apex’s CTRL Hanguard System, I can bump it up a bit to the 1:30 position and still have the ability to slide the positioning of that rail forward or back in the slots before tightening everything down. It may seem like a little thing initially, however after you have been limited by other rail systems, Apex’s CRTL improves ergonomics. If you follow any of my reviews, you know I love long forend rails. The main reason is that one you attach a bipod or light on a carbine or midlength rail system, you support hand ends up being all jammed up against the magwell. With long rails, you can mount all the accessories you want and still have plenty of room to place your support hand where it is comfortable. Other nice touches are specially treated machine screws which can survival 1000 hours salt corrosion tests and several hex wrenches to complete the install. FUNCTIONS For this install swapping from another handguard to the Apex Extended Handguard was extremely simple. Remove the old handguard, assure the stock barrel nut is securely in place and align the Apex handguard coupler with the barrel nut, instal the handguard via four more machine screws and then tighten the coupler and handguard down. The Apex Handguard system also features two Quick Disconnect sling swivel mounts per side integrated into the handguard. I kept things simple and only installed 1.5” rails at the 1:30 positions for a front and rear set of YHM back up sights for 3-gun style 45 degree competition shooting. Since that whole idea has been all the rage lately, I decided it was time spend a little more time with the concept. Apex has full top rails and other various lengths as well to equip your handguard just how you like it and shape the layout to your grip and your shooting style.